The data acqusition systems are used for both teaching and research. There are currently three National Instruments SCXI systems, with one each devoted to the servo-hydraulic fatigue testing lab, undergraduate mechanics of materials laboratory course, and the graduate experimental solid mechanics course. However, when each system is not in use for its primary duty, it is applied to the other tasks as needed. 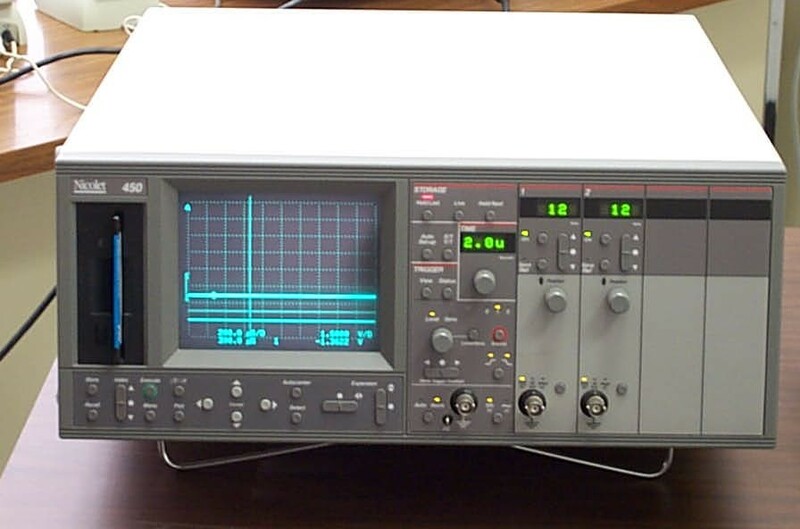 In addition, the lab contains a high speed Nicolet 450 Digital Oscilloscope and a Nicolet 3091/310 Oscilloscopes. Descriptions of the SCXI modules are listed at the end of this section. for this product is located should be available on the NI website. manual should be available on the NI website. This is cabled to a CB-68LP 68 pin terminal block. to the Program-In port of the servo-controller. The system runs with NI-DAQ 6.8.1 and applications built with the Labview Application Builder. at 10,000 lbs. On the 50,000 lb load range, the DC2 conditioner will -2 V at -10,000 lbs. signal resolution problems. Gains that are too large will lead to overscale problems. reports a relative accuracy of 115 uV. When the MTS 407 is set for the 10,000 lbs = 10 V range, the (theoretical) resolution of 0.115 lbs is achieved. would likely not be achieved due to the signal conditioning in the MTS-407 among other things, but the point is that the 6052E A-D board is no longer the issue it was when using the AT-MIO-16E-10. Thus it should not be necessary to use any signal ampification when using the 6052E to capture load and stroke information from the MTS 407 on the 810 frame, while using the 16-bit 6052E board. If a relative accuracy of better than 0.115 lbs is needed for a testing application, then a smaller capacity load cell should be used. For fatigue testing, it is advisable to keep the cutoff filter level set to 10 kHz. The filter is a low-pass filter, and will reject any frequencies above the cutoff. Thus, the 4 Hz filter level is usually not a good choice, as my typical fatigue testing frequencies of the MTS 810 system are 5 Hz and above, depending on the specimen compliance. 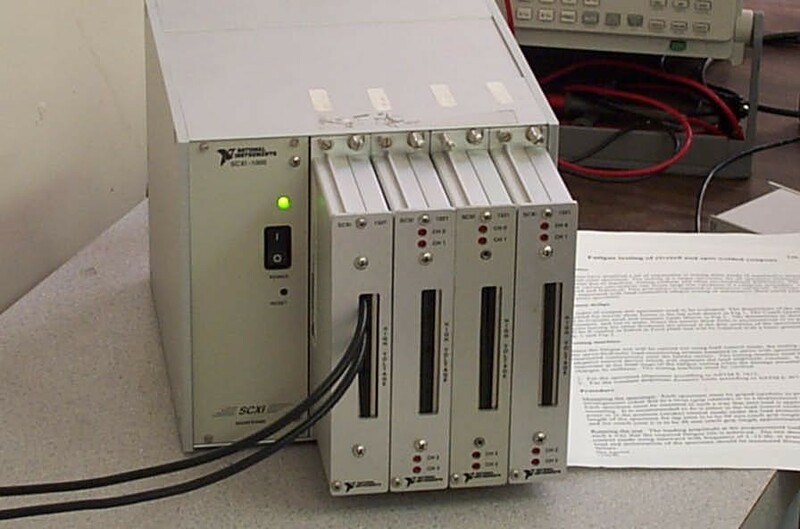 Electical noise in the materials testing lab appears not to be a source of concern at the testing frequencies that can be reasonably achieved. 3.33 V excitation level, volage mode, 10 kHz filter. This web-page should be updated to reflect the present state of the SCXI system. The computer is a P5-100 Gateway Computer with 80MB RAM running Windows 2000 Professional. The module in slot 1 is multiplexed to an AT-MIO-16E10 (ISA) card. The manul for this board should be on the NI website. The computer is a Pentium Pro Gateway Computer with 192MB RAM running Windows 2000. Lab and for development of VI's for use on all of the systems. the jumper settings on the board and in the Windows 2000 device manager must both be changed. in 2048 or 4.88 mV. helpful for comparison purposes to the 6052E board. theoretical, and the actual values will depend on the device and signal conditioning in the MTS-407 among other things. SCXI-1121 Four channel strain gage module with isolated signal conditioning. SCXI-1321 Terminal block for 1121 with null offset adjustment for each channel. SCXI-1122 Sixteen channel strain gage module (multiplexed). SXCI-1322 Terminal block for 1122. SCXI-1327 Terminal block that attenuates high voltage signals. SCXI-1308 50 pin terminal block for SCXI and AT-AO-6 board..
Labview 6.x and 7.x Full Development System and Application Builder, NI-DAQ 6.8.1. 6.x is still used for particular applications. is used for collecting data from impact (e.g. terminal ballistic experiments). fatigue testing. 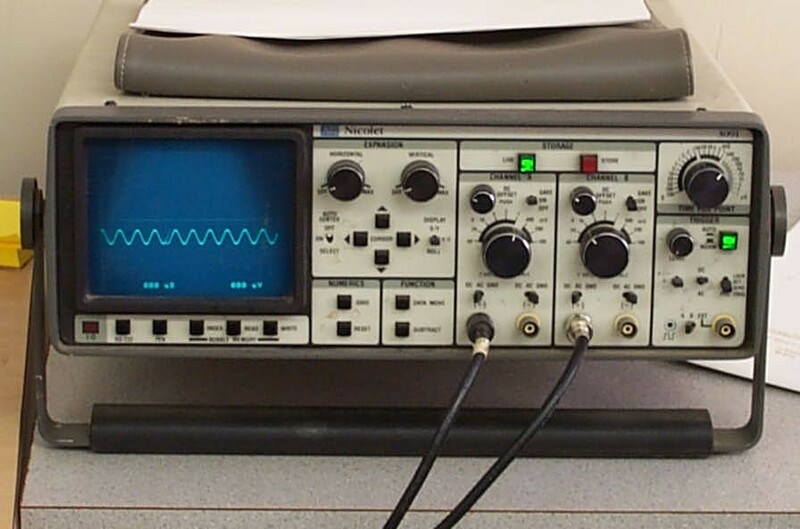 The lab currently has (1) 310 and (2) 3091 oscilloscopes.